Microsoft has integrated Halo’s lead character Spartan into its Ready for College advertising campaign, with television commercials featuring the warrior on campus. 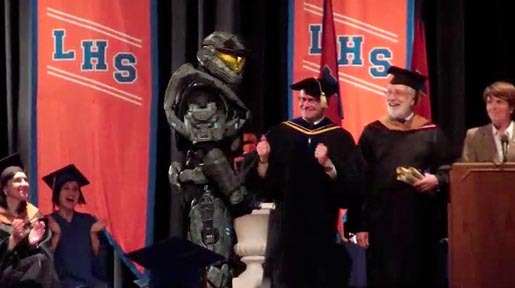 Spartan dons cap and gown for a high school graduation, and wanders around a college campus, before dealing with some alternatives to Microsoft’s special Windows PC and Xbox combination deals (Futon/Allen Key and Fridge/Ice Tray). The campaign is online at Windows.com/FreeXbox. The Halo at College campaign was developed at Crispin Porter + Bogusky by associate creative director/art director Andrew Lincoln, associate creative director/copywriter Matt Talbot, executive integrated agency producer Tony Tung and agency producer Sloan Schroeder. Filming was shot by director Keith Schofield via Caviar, Los Angeles, with executive producers Michael Sagol and Jasper Thomlinson, producer BP Cooper, director of photography Damian Acevedo, production designer Benji Bamps. Editor was Wayde Samuel at Plus Productions, Boulder, Colorado, with executive producer Idalia Deshon. Post production was done at Method Studios, Santa Monica, with VFX producer Cara Farnsworth, lead CG artist Mike Warner, lighter Todd Herman, FX artist Morris May, Flame artists Kelly Bumbarger, Pierre Laguerre, producer Cara Farnsworth, executive producer Robert Owens.